Seviper is one of those Pokemon who is kinda forgettable but for some strange reason I find kinda cool, probably because I like the rivalry it has going on with Zangoose, in a parallel to real life's rivalry between the mongoose and the king cobra (which makes it rather weird that Zangoose isn't rivals with Arbok instead). The two Pokemon will even gang up on each other when encountered in hoards! Seviper's other main claim to fame aside from the rivalry with Zangoose is being the replacement for Jessie's Arbok in the anime, where it actually managed to stay on her team for much longer than the original Poison-type snake did, though sadly it didn't show a whole lot of distinctive personality aside from being quite a bit more aggressive than Arbok ever was. 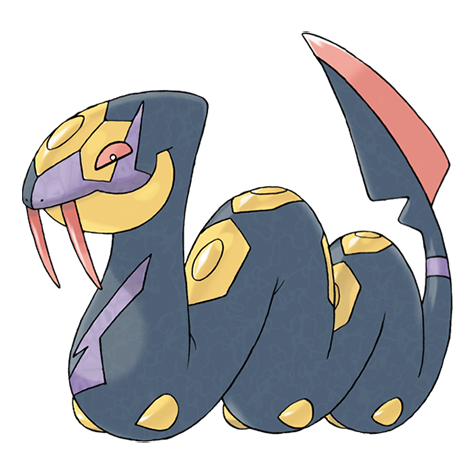 There was also that one hilarious time when 4Kids erroneously and infamously called Seviper Arbok's evolved form. Seviper actually has a pretty long history in the franchise, but it didn't leave that as much of an impact as other Pokemon have done. One of my old favorites that I like nowadays still but mostly for nostalgia reasons rather than battling reasons. That said, I can actually answer why it's Seviper and not Arbok that has the rivalry. See, mongooses have a rivalry with another snake known as the "habu". Personally, I think the reference is mainly to the Protobothrops flavoviridis, a species of venomous pit viper native to Japan. Back in 1910, in order to reduce the Habu's populations in Okinawa, they introduced mongooses. The effectiveness of this move has been strongly debated as it seems to have effected birds and other smaller wildlife more than the snakes, but I believe this is likely the origin of that rivalry. Which would explain why Seviper is a pit viper and not a cobra. Neat stuff.